The way kids engaged with media used to be pretty straightforward – watch TV, listen to music or read. With the ubiquity of mobile devices, all these activities can be done in a variety of different ways. 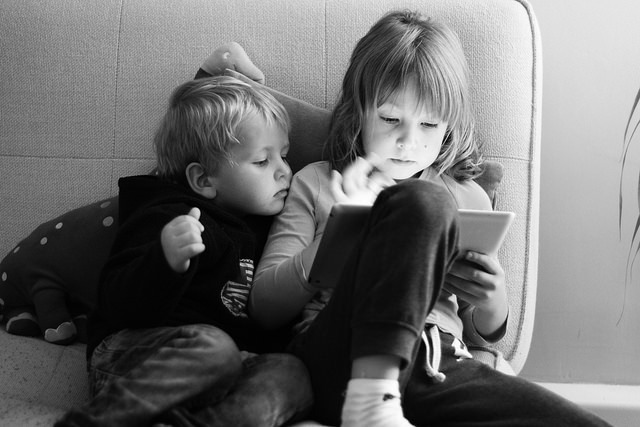 As a new study from Common Sense Media points out, this makes it harder than ever to define “screen time,” and to understand what is beneficial and what is detrimental to a child’s development. As researchers and parents wrestle with this issue, study after study confirms that kids of all ages, from babies to teens, are spending more and more time in front of screens. Diane and her guests discuss the latest research on screen time and kids. MS. DIANE REHMThanks for joining us. I'm Diane Rehm. A major new study from the organization Common Sense Media released this week says teens spend a whopping nine hours a day consuming media, 46 percent from a mobile device. In another recent smaller survey, researchers found a surprising number of toddler use these devices without supervision. MS. DIANE REHMHere to discuss the latest research, Lisa Guernsey of New America, Rachel Barr of Georgetown University. Joining us from New York City, James Steyer of Common Sense Media and from Boston, Dr. Michael Rich of the Center on Media and Child Health. Throughout the hour, we'll welcome your calls, questions, comments. Call us on 800-433-8850. Send an email to drshow@wamu.org. Follow us on Facebook or send us a tweet. And thank you all for being with us. MS. LISA GUERNSEYGlad to be here. MS. RACHEL BARRThank you so much. REHMJim Steyer, I'll start with you. Tell us about this study, how you formulated it and how you discerned that teens are spending as much as nine hours a day using media. STEYERWell, Diane, this study is done every five years and previously, it was conducted by the Kaiser Family Foundation and they bequeathed that to Common Sense Media a few years ago, but the principle researcher, Vicky Rideout, who oversaw the studies over the past decade, also conducted this study. And it's a survey of over 2600 young people in the United States, about their media and technology uses. STEYERAnd as you said, nine hours per day of media and technology on average for teens, not including time spent in school. So they are doing more with media than anything else in their life, including sleeping, spending time with friends, parents or teachers. It's a whopping number indeed. REHMSo what did the kids themselves tell you about the time they're spending? STEYERWell, I think they basically said that media and technology are almost like the air they breathe now. They live on those platforms 24/7 and as you indicated in the opening, mobile platforms, in particular. And they told us several things. One, they still love stuff like TV and music. That's their favorite forms of media. Only 10 percent of them like social media as their favorite form of media, but they feel they have to be there. STEYERThere's almost a utility-like factor to social media, I think, in teens lives. They also said, two out of three of them, said that they multitasked while doing their homework, meaning that they were sometimes Facebooking or Instagramming their friends or text messaging their friends and other research makes it clear that that totally interferes with your ability to concentrate and go homework. So that was a big message to parents and teachers as well. REHMAnd Jim, you're not just talking about teens. You're talking about tweens, between 8 and 12? STEYERAnd tweens, 8 and 12, also live in a 24/7 media environment. They average about six hours per day with media and technology, not including time spent in school. And as the father of an 11-year-old, among other children, that is a pretty shocking statistic as well. And what you also see is big difference between boys and girls, between kids from different racial backgrounds and socioeconomic backgrounds. STEYERThe bottom line is this. Our kids lives in childhood and adolescence today are being dramatically shaped in so many ways by these extraordinary media and technology platforms they live on. REHMJim Steyer, he's founder and CEO of Common Sense Media. They released a big report this week on media use among tweens and teens. Now, turning to you, Dr. Michael Rich. You are founder and director of the Center on Media and Child Health at Harvard Medical School. To what extent should we be concerned about the time these kids are spending on media? RICHTo the extent that it excludes or displaces other aspects that are necessary for their health and development, such as sleep, spending time with family, outdoor play, physical play. But I think the issue is more than just the time that they're using it. The reality is they are using it and we have to start directing our concern from how much they're using it to what they are doing with these media and then what context they're doing it because so many schools, so many of our communities are now building themselves around a technology that is able to facilitate those activities, that the concept of screen time is really obsolete. RICHWe can't have screen time limits. It never worked when the American Academy of Pediatrics recommended a limitation. We need to, first of all, understand how these kids are changed and how they are learning and what is happening for them in their developmental space so that we can move beyond the hand-wringing of, oh, my god, they're spending so much time on it and roll up our sleeves and figure out what's going on. REHMYou know, the thing I think that worries me the most is that you see all these kids with each other, but each on their own screens, Dr. Rich. They're not talking with each other. Even at the dinner table, they may not be engaging with parents or siblings. They're on their screens. Now, isn't that something we ought to be concerned about? RICHWell, let's start with the parents who may be not engaged with their kids because they're on their screens. I mean, let's face facts. Kids hear about 1 percent of what we day, but we hear 100 percent of what we do. And if their parents are busy doing the Crackberry Prayer at dinner, they're going to emulate that because they are learning how to live in the world and how to behave. And parents still have the strongest effect on their kids development and the direction their kids go. RICHSo the choices parents make is the first thing. The second thing is that we have blindly embraced these technologies 'cause they're sparkly and shiny. You know, they're the latest, newest thing. They do things faster and quicker and, you know, just like they say, caffeine, it makes me do stupid things faster and more often, same thing with these technologies. You know, they were supposed to help us be more efficient, and what they've done is they have captured us 24/7 in terms of both our work demands and for kids, their social demands. REHMAnd to you, Lisa Guernsey, director of The Learning Technologies Project in Education Policy at New America, you're the author of a new book titled "Tap, Click, Read: Growing Readers In A World Of Screens." I gather you'd like to have more in-depth understanding of exactly what kids are doing with these screens. GUERNSEYYes. That's right. And we are starting to get a little bit of an understanding of that. These kinds of surveys that we're talking about here help us to understand the ubiquity of media and children's lives, but just as Dr. Rich said, they don't necessarily get to that context and the content and how children are interacting together and with their parents and with their teachers and their caregivers around this. GUERNSEYIn the book, "Tap, Click, Read," which was co-authored also with Michael Levine who is founding director of the Cooney Center in New York City, we tried to look much more closely at how those interactions are changing the way children learn language and learn early literacy skills, the precursors of reading. And we found that it's highly variable and that if parents and educators are using media intentionally and recognize certain sources as a prompt for conversation and real social interaction, then it can be harnessed to truly improve language development and literacy. But we have to use it intentionally. REHMAnd to you, Rachel Barr, you were at Georgetown University. Your research has focused, I gather, on toddlers and how they are using screens. Tell me about that. BARRRight. We've had a look for a very long time about how they might be able to learn from screens and also how it might be challenging for them. And we've got a couple of big take-homes. One is that they do find it challenging, such that if they learn something on the screen from a book, from a touch screen, from a computer, from a television, all of these sorts of media add symbols and symbols are very difficult for toddlers to understand. BARRSo when they learn that information from the symbol and then they come out into the real world, we see a deficit. So we see less learning from them than from a face to face interaction. However, I want to just clarify what does that mean and what it doesn't mean. What it does mean is that this means it's cognitively demanding. Even though these screens look so simple and babies are able to just sort of zip around a touch screen no problem, it's actually not as easy as it looks when we really closely measure it. BARRThe second thing is, though, that they can actually learn and then finally, when they're given support, when there's joint media engagement, so if somebody is talking with them about them, describing things to them, then this is actually able to overcome that, so. REHMRachel Barr, she's associate professor in the department of psychology at Georgetown University. We'll take a short break here. You can join us by phone, email, Facebook or Twitter. Stay with us. REHMAnd in this hour, we're talking about a new study released this week by Common Sense Media. James Steyer is the founder and CEO of Common Sense Media. They released a big report this week on media use among tweens and teens. But we've got the whole picture covered. Rachel Barr is an associate professor in the department of psychology at Georgetown University. Here research is focused on young toddlers and how they are being introduced and then accustomed to the use of social media. Lisa Guernsey is director of the Learning Technologies Project in the Education Policy Program at New America. Her -- she has co-authored a new book titled, "Tap, Click, Read: Growing Readers in a World of Screens." REHMAnd Dr. Michael Rich is founder and director of The Center on Media and Child Head, associate professor of pediatrics at Harvard Medical School. Do join us, 800-433-8850. Jim, I must say, your organization did a comparison of how much kids are using social media back in 2013 and 2011. You saw a huge jump between those two years. STEYERThat's right, Diane. I think what we see here now is the true digital native generation, whether it's toddlers, whether it's tweens, whether it's teens. I think that the digital and mobile platforms that all of us adults have had to get used to as well in our lives have really reshaped childhood and adolescence, from birth to 18. And the implications are extraordinary and quite frankly, as a society, we ignore them at our peril. Because this is the reality that we're going to be dealing for years to come. And we have to be smart in the way we manage it. REHMWe have an email here from Boyd, Dr. Rich, who says, does media suppress youth physical activity? If so, how much? What are strategies to motivate increased exercise, especially outdoors? RICHWell, you know, anecdotally and observationally, yes, they have changed them. In fact, they've changed the way kids use playgrounds. Even when they don't have devices, kids are walking in circles around playgrounds instead of playing and climbing and swinging and jumping. So they are emulating their social media environment even when they don't have the devices now, which is really fascinating. But unfortunately, as yet, we as a society have not committed the research dollars to really understanding what's going on. RICHYou know, it's great when an organization like Common Sense Media can make a census like this happen, but what we really need is a deep-dive into the effects of the -- using these media on kids not just in the short term in a laboratory situation, like the fabulous work that Rachel Barr does, but long term. What happens with those babies, not just in the lab today and a month from now, but when they're five and when they are 15 and when they are 35? And we need this work. And we've come close a couple of times. There was a bill before Congress that ultimately did not get passed that would have invested NIH dollars into really examining the influence of media on the health and development of all of us. RICHAnd the National Children's Study, if it had ever happened, was going to have a huge media component to it that we all developed. But unfortunately, that study got defunded. REHMHere's an anecdotal comment from Aaron, who says, we used to let our kids have lots of screen time. Now we limit it to 30 minutes in the morning and night, mobile just one day a week. We changed because of concerns about our oldest son's behavior development. We noticed a marked improvement when we took mobile devices away. Now we don't have any research to back that up. It's one parent's anecdotal comment and her own research. Jim. STEYERYeah. I -- Michael's absolutely right. You know, Common Sense is a large advocacy group, in addition to the research and consumer work that we do. And we agree. It's -- yesterday we had a major hearing in Washington, D.C., on the results of this study. And I basically said that Congress' behavior in this area is pathetic. Because we're conducting the biggest experiment on our children's lives in any of our lifetimes, with virtually no research. And Michael's right, you need to longitudinal research, you have to see how it plays out over time. STEYERThe idea that we are not willing to invest NIH or NSF or Department of Education dollars in this is nuts because this is really all of our kids. And it's not a partisan political issue, it's an American societal issue. So that research is critical. And so is a lot of other action steps that this report clearly makes obvious to the -- I hope, to everyone in our listening audience. REHMLisa Guernsey, how do children learn to speak? GUERNSEY...with older siblings, happening all the time. And those are moments for really authentic interactions that children have been in studies shown to be learning language and words from. So to be alarmist and wring our hands about how much time, doesn't get us deeply into the questions of those kinds of social interactions and what children are interested in, curious about, how they may want to go and explore new things because of what they've seen. So that has to be part of the picture as well. REHMBut Rachel Barr, how do you see it? BARRI see it actually exactly the same way. So as I was starting to say, this idea of joint-media engagement is something that's really important that we've looked at for really quite a long time. And we can learn a lot from the really positive effects that we get from book reading. We know that book reading can be very positive because parents and children engage together. They engage in really rich language experiences. And children point out the things that they're interested in and parents follow in. And this really helped language develop. REHMAh, but you're talking about interaction. And I'm wondering about that toddler, say, all by him or herself. BARRRight. And I think that that is a different -- I think that that could be problematic. And in fact, we have some survey data collected with Deb Linebarger that suggests more that this not only alone time but background television as well can be problematic. So just as multitasking is distracting to teens and tweens, what we're finding is that background television is also very distracting to toddlers. BARRSo if the television is on and the baby is playing in the corner and it makes no sense to the child, every now and then the child will look up to see. So there's a ding, they look up. Then they go back to their play. When you look at the child's play, the play is disrupted. And there's a second, there's a double-whammy. So the parent is also engaged in the show. Now this may be their own television or something that is on their own device. And what happens there is that the parent becomes engrossed and so, whenever the child tries to get their attention, it's very difficult for the child to get their attention. BARRSo it's not necessarily -- and this comes back to Lisa's comment here -- it's not just the time but it's the child, so how they can learn in this -- from this media and that they need support. It's not just -- it's the context, so who's talking with them? And it's the content, we need to really think about what it is that is age appropriate for different children. And in that, we're starting to get a better idea. REHMAnd Jim Steyer, clearly, there, we need more research. STEYERWe do. And Lisa and Rachel are absolutely correct. We don't -- we can't be alarmist about this because this is the reality we're living in today. And it's all about how we use it. You know, it's interesting, another part of Common Sense Media, we have over 100,000 member schools at Common Sense now. And we teach digital literacy and citizenship curriculum. We created it actually with one of Michael's colleagues at Harvard, the great Howard Gardner, the leading child development expert in the country. STEYERAnd it's a curriculum, now over 100,000 schools in the United States use this curriculum. And it's about the safe, ethical and responsible use of media. And whether you're a 12 year old or a three year old, it's much about how you use it. And so we can provide guidance. We also need to educate parents. Because a lot of parents out there need guidance and some of us can be clueless about how to parent well in this new digital age. So it's not an alarmist reaction that we should have. It's -- we need a focused, direct and smart reaction that guides us and our kids into this new media reality that we're all living in. REHMAll right. So Dr. Rich, when my kids were growing up, part of the assignment for parents was to sit and read with them from a book for one hour a day. They were only at school until one o'clock and then the assignment was left to that parent for one hour a day. Now we live in a new world where two parents work, kids come home, they watch TV. What do you see as different problems between television and mobile devices? RICHWell, first of all, the interactivity with reading to a child is much, much more than just the words on the page coming out of mom's mouth. There is physical contact, there is snuggling, there is gaze exchange between them. There's bonding going on. So we're not even -- moving beyond just the cognitive material involved, we're dealing with social, emotional growth. And this is really essential. When you are dealing with a screen and, quite frankly, as this study and many others have shown, you know, the majority of parents use these screens as babysitters or pacifiers. They check out -- either physically check out and go make dinner or take a shower, or they verbally check out, so they're not interacting. RICHAnd the verbal utterances between child and parent drop dramatically when a screen is on because the parent watches the screen. And co-viewing, as much as we think it's good -- may be more about watching what the parent wants to watch than what's appropriate for the child. REHMAnd you're listening to "The Diane Rehm Show." And there are lots of folks who'd like to be part of this conversation. Let's go first to Elaine in Raleigh, N.C. You're on the air. ELAINEThank you very much, Diane. I appreciate the opportunity. ELAINEMy -- the reason I called is I heard one of the guests state that time limits don't work. And I was just astounded. I was wondering what supports this statement because, in my experience, it's -- time limits are exactly one of the tools that parents have. And actually there's a responsibility that -- to limit how many hours a child can use the devices, what they use it for and then also to use the devices as incentive, where, if they do whatever, then they earn minutes with the devices or their favorite show, et cetera. So I was just really surprised. REHMWhat do you think, Lisa? GUERNSEYWell, I think that may be referring to a statement that Dr. Rich made and I'd love his comment on it as well. But as I understand the research, really it's that a one-size-fits-all time limit does not work. And that certainly has been found to be true. What we know from parenting research is that children need limits in everything, right? They need limits with how much ice cream they're going to have today. They need limits on when they need to put their blocks away, because we need to now go and pick up your bigger brother from basketball practice. So of course limits are part of being a good parent and childhood. GUERNSEYWhat's tough now, in parenting -- and I'm saying this as a mother of someone who's raising two daughters in this digital world -- is to help transition children from moments when they may be engaging with something on a screen, even a Face Time conversation, but certainly any kind of really engaging activity, and to have them have to turn that off and move into a different activity. And parents need new guidance and strategies for doing that so that they can provide a healthy routine for their children. RICHAbsolutely. Screen limits, as in up to two hours a day or one hour a day of quality educational television, which is what the American Academy of Pediatrics recommended, is an obsolete concept. Because it ends up with the parent stuck in the middle of, you know, is this quality? Is this educational or not? And they don't have the tools or the information to do that. Limit-setting is a critical skill, if not the central skill, of parenting, across the board, not just for media use but for everything, including hitting your brother, eating your vegetables and getting some sleep. RICHSo limiting screens is not the problem. The problem is that you can't -- and there's no evidence to support that a certain amount of time is okay and more than that is not okay. And that's what people seek. REHMAll right. I know -- I know Jim Steyer wants to jump in quickly. STEYERWell, I -- I mean, I think the bottom line for the caller is, I think it's very smart to set limits. Michael's right. He's -- Michael's right about various aspects of screen time. But you've got to set limits. And you've got to take the device away, as a parent. And media needs to be treated -- and technology need to be treated as a privilege not a right. That is basic about parenting. And I think one of the things that we need to do and I think this is a big focus of our work is, hey, you've got to make it easy for parents to set those limits in a smart way and then get kids to understand that. REHMJim Steyer, founder and CEO of Common Sense Media. I know many of you are calling in with questions, comments. We'll take a short break here and get to as many as we can when we come back. REHMAnd welcome back. As we talk about the use of mobile devices among not only toddlers but tweens and teens. The amount of time spent, the quality of that time spent. Here's a comment from Twitter that I know you'd like to comment on, Lisa and Rachel. It says, we've used, quote, "Your Baby Can Read" on our son from months old. It's worked, but we have concerns about his attention span. Rachel. REHMAnd maybe even have negative effects? BARRSo, not necessarily have negative effects, but maybe just have neutral effects. And this really comes back to the fact that media really is a tool. And there's various different content and how parents are sort of using those tools is really important. So, any sort of television content, if parents can provide additional information, here's the difficulty for a child. Whenever they're learning, back to this point, whenever they're learning is simple. When they're learning a book, they need to learn about print concepts. BARRWhenever they're learning from television, they need to learn about how the television is built. The app, how the features are built. All of these things really take time for the child to learn, so it's actually quite difficult for them at the very beginning. So, no product, necessarily, is going to be able to just do that by itself. GUERNSEYAnother problem with things like, "Your Baby Can Read" is that they're very flash card based. That the idea is to have flash words up on screen or letters and to have children now ingest that. But what we know from the research on how children learn language skills, and how they eventually learn to read is that they need a much deeper and rich conversation around, really, interesting and engaging content. And they need parents who will listen to their questions and answer them and have a back and forth exchange. REHMAll right, and here's a comment from Shannon in at the University of Oklahoma, who says, we limit our son's screen time to one movie during the week and a few hours at most over the weekend. But at his school, and get this, he's in first grade, they have homework assigned on apps that are supposed to do, that they're supposed to do every night. Research is needed immediately, because it's the norm for these six-year-olds to use iPads and tablets every day, which is awful for kids' development and behavior. Jim Steyer. STEYERWell, you know, Diane, this is raising a very important issue, which is that technology is now becoming a central tool, in Rachel's correct terms, in our educational system. And in schools across the country, technology's being introduced as early as kindergarten and first grade. Whether it's an iPad or laptop or you name it. And so, educators across the country need to deal with this. I mentioned earlier that we built a digital literacy and citizenship curriculum with our colleague Howard Gardner at Harvard. STEYERAnd the reason is is because it's all about the safe and smart and responsible use of that. And by the way, you have to educate educators about how to do this. So, the next frontier, in addition to parenting properly in the digital age, is educating our kids in the digital age. Because there are issues there about the appropriate use of technology, plus, and one of the findings of this study, is there is a major digital equality gap between low income kids and their access to media and technology and middle and upper income kids. STEYERThere's actually a homework gap in this country between poor kids and everybody else. So, we have to address this in schools across the country, because they are going digital as well. REHMAll right. And here's a caller in Vienna, Virginia. Jennifer, you're on the air. JENNIFERHi, can you hear me? JENNIFEROkay, great. Thanks so much for the opportunity. Yeah, I just wanted to ask your guests a little bit more about human factors. In Romania, in the 80s and 90s, kids were, got locked up in orphanages, they had very little eye contact or skin contact with other people. And now, they have a very big difficulty interacting in the world. They're emotionally stunted, et cetera. And so, I would like your folks to talk about giving more credence and respect to human factors and the importance that we have as human animals to be touched and use our senses to develop properly. RICHThis is an absolutely essential part of all of this discussion, which is that we cannot let these tools supersede or intervene between humans and children. We know that for early brain development, in particular, but for social emotional development, really, throughout the life, that the single most powerful learning tool and brain building tool is human connection. Eye to eye gaze, skin to skin touch. And from the tragedy of the remaining orphanages, where these kids were literally warehoused, we have learned much, not just about connecting with people, but they're unable to keep attention on anything. RICHThey have attentional difficulties. They have learning difficulties. Because they lived in such a high state of stress, so much stress hormone, cortisol, in them at all times, that they were hyper vigilant, but they don't pay attention to anything. And so we owe it to our children to give them a warm, nurturing embrace from the moment they're born until, really, the, to the grave. Really. RICHAnd that is the single most important thing, and I think that that is the aspect of media use that really is a problem. We have traded away connectedness for connectivity. REHMAnd here's an email from Stephanie. Jim, I think you can take this one. Please define media. I don't know if you're just talking about media where kids are looking at screens, or if it also includes listening to music, reading books, which are also forms of media. REHMWho was on this program just last week. STEYER...and Diane, you know, Dr. Rich is totally correct about this. And I think one of the biggest concerns I have as a parent of four and running a large kids organization is the human connectivity factor. When kids are texting each other, although they're sitting 10 feet away from each other, rather than having that conversation, it's an enormous challenge. My late colleague at Stanford, Cliff Nass, did great studies about the empathy gap. And this is a really important issue that we need to address, I think particularly for teens and tweens. STEYERWhich is when you are no longer having conversations in a human format, but in a very sort of, very abbreviated and impersonal way, via text messaging or social media. It changes the nature of human interaction. It limits intimacy, empathy, and some of the basic human connections. So, this is an incredibly important issue for all of us to discuss. REHMAll right, to Saginaw, Michigan. Farrah, you're on the air. FARRAHHi Diane. Thank you for becoming such an integral part of my day. BARRI just also want to think about it from a way that maybe we could use the tools. So, we've talked a lot about how we are consuming media. But there's also been a couple of really great studies recently, which have shown how texts, even though they can be very cold and brief, can be sent to parents to provide them with information about activities that they can do in the here and now. So, if you're on the bus, how about you play Peek-a boo or if you have access to a digital library, you can download an e-book to read with your child while you're waiting. REHMBut what about, as our grandmother says, the art of conversation? BARRThe art of conversation. And we have one program that we've had for the past seven years where we've used media in a relationship based program. So, we've used media as examples of very positive parent/child interactions. We've shown these to incarcerated teen fathers. And then they interact with and play with their children. Initially, they talk very, very little to their children. But after seeing these models via media, and it's called the Baby Elmo Program, because there's Elmo and his dad. BARRWhat happens is that gradually, across time, when they're playing with their children, they are much more warm, much more responsive, and are engaging, talking, praising more with each other. So I think we can also utilize media as well to provide, really, useful tools for parents and for children too. GUERNSEYIn our research for Top Click Read, we went out to sites around the country. Early childhood programs, libraries, and we collected video clips of how that art of conversation can be, in fact, stimulated by different kinds of media. And then, of course, not with media, as well, they can have all sorts of conversations without it. But there are moments where it can be a prompt. So, on tapclickread.org, for example, we have five of these videos up that anybody can see that show parents and children really joyfully engaging with different kinds of media. GUERNSEYPrompting new conversations, running around outside, collecting leaves and photographs of things and building books and experimenting and photos. So, that art of conversation can still happen. We just have to harness the media to do it. REHMExactly. Dr. Rich, I want to ask you about the effects of media multi-tasking. What do we know happens in the brains of young people with this opportunity, if you will, to multi-task? RICHWell, first of all, what we know is that multi-tasking is actually a misnomer. They are not actually doing multiple tasks simultaneously. They are rapidly toggling between tasks, but their attention bounces from thing to thing to thing. And is rewarded for that kind of superficial bouncing from thought to idea to image. Interestingly, they buy into the fact that they're truly multi-tasking. And when studies have been done with MIT students who are arguably among the smarter ones of our world, who genuinely believe that they were covering more material, which they were. RICHBut they believed that they were doing it with the same fidelity. In other words, that they were receiving understanding and retaining this information. And the information, you know, really was shockingly poor. You know, about 80 percent, at best, of what went on they were able to retain when they were multi-tasking. And their mistake level was huge. It was down around 50 percent. But they believed they were as good as when they were mono-tasking. REHMAnd you're listening to The Diane Rehm Show. What do you think of that, Jim? Does that support the kind of work that you're doing? STEYERYes, Diane, it absolutely does. And as I mentioned, in this study, you can see that two out of three teenagers think that they can multi-task. And they can't. And the research is clear that you can't. REHMWhat do you mean you can't? STEYERYou -- Michael just said, he laid it out, actually, correctly from a development standpoint. You can't focus on two things at once. You switch back and forth between two different things. STEYERWhich means you can't concentrate as well on one thing. And it's why multi-tasking is such a challenge to doing your homework well. Because how do you focus on Shakespeare and whatever the passage means in a Midsummer Night's Dream when you're also sending a text message to your friend or you're checking out your photo on Instagram at the same time? You just can't concentrate. Your brain doesn't -- and by the way, adults can't either, so they're kidding themselves if they think that multi-tasking is actually something that they can do effectively. STEYERThis is a very important message for parents, educators, and all of us to understand. REHMAll right. And let's take one last caller. Lori in Gilmanton, Iron Works, New Hampshire. If you can make it quick, please. LORIYes, I am the mother of four. A married mother for 30 years. And myself and my husband have raised our children and I think the important thing to remember here is balance and that it is the parents job to raise your child. And I think limiting all sorts of computer screens is important. People need to interact with one another. Children learn from role modeling. It's not anything new here. We've been a civilization of human beings for a very long time and I think we are absolutely in a time when things are moving too quickly and we're forgetting the basics. LORIAnd the basics are to interact with one another, get outdoors, and be in touch with the hair on the back of your neck and the feeling in the gut of your stomach. REHMI think those are wonderful points. The fact of the matter is, however, in a world filled and increasingly so with the availability of technology, it does come down to parents. It does come down to individual approaches and attention to what the child is doing. Lisa, I'm going to give you the last word. GUERNSEYThat's right. And we have been looking at, what's often called media mentorship. The idea that parents need new role models for how to use different kinds of technology with their children in ways that are developmentally appropriate. In ways that encourage conversation. That librarians and child care professionals and teachers can help to be those mentors for families. We have to put the human power back into this. And let the technology simply be an assistant, not the central role. REHMLisa Guernsey, Rachel Barr, Jim Steyer, and Dr. Michael Rich. I thank you all for a very invigorating conversation in which we have used media, because the two of you, Jim Steyer and Michael Rich are on Skype. And you two are here in the studio. Wonderful conversation. Thank you.